Whether you’re managing maintenance for an entire fleet or overseeing service and repair operations for a leasing or contract maintenance provider, you need a highly organized system to keep your costs and downtime from spinning out of control. One element in that highly organized system is the Vehicle Maintenance Reporting Standard (VMRS). This standardized set of codes and terminology enables fleets to describe assets, service events and operations including complaint, cause and correction as well as component and position. Without this common language, miscommunications occur, data quality for reporting is poor at best and ultimately this impacts your decision-making and costs. VMRS codes provide a universal language that enables stakeholders across the entire service supply chain including OEMs, dealers, service providers and fleets to understand the specifics of any service event – driving consistency, better reporting and lower costs. 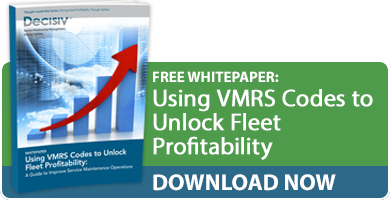 A recent article in Fleet Owner describes how one fleet used VMRS codes to streamline its inventory from $200,000 worth of parts to under $75,000. Not only does that eliminated expense go back into the fleet’s bottom line, but also the leaner operation is likely to make navigating the parts room easier and more efficient. When you consistently use VMRS codes in your operations, you’re able to look back at component and parts usage trends. The historical perspective helps you improve your parts inventory management and purchasing processes, but also helps improve your preventive maintenance (PM) schedules based on recorded failure rates over time. As an article in Vehicle Service Pros points out, standard repair times (SRTs) are vitally important for any internal shops or third-party service providers. SRTs are critical for measuring the efficiency of your maintenance and repair operations as well as your individual technicians. SRT information is especially valuable to fleet maintenance managers as they make decisions regarding where to have repairs and maintenance performed and which technicians to use. As with all data and reporting, it’s important that SRTs compare the exact same maintenance and repair jobs. This is only possible when a standardized language, such as VMRS codes, is being used consistently. Otherwise you risk comparing apples to nectarines. Once you’re consistently using VMRS codes in your operations, you have a lot of powerful data at your disposal. To get the most out of that data, you need a tool such as a Service Relationship Management (SRM) platform to make leveraging that data simpler and more efficient. By combining the standardization of VMRS codes with the powerful communication and analytics made possible by SRM, you set in motion a process of continuous improvement that helps you drive uptime and profits. And best of all, with SRM, you don’t have to memorize any numbers or codes, since VMRS is laid out in common, friendly terms. How consistently do you use VMRS codes in your operations? What process do you go through when establishing SRTs? Please share your thoughts by posting a comment below.